Please note: This production is sold out. Following previous sold out performances, Eric Abraham and the Fugard Theatre present two solo piano concerts by global music icon and South African legend Abdullah Ibrahim. The concerts, Water from an Ancient Well, will take place on Heritage Day, Monday 24 September, at 3pm and 8pm. The 8pm performance is presented by the Fugard Theatre, with the 3pm matinee performance being presented in collaboration with the Japanese Embassy as part of the Japanese Consulate Centenary. Mr Ibrahim was recently announced as one of the 2019 Jazz Masters being honored by the National Endowment for the Arts (NEA) in the USA. Since 1982, the NEA has recognised artists who have made exceptional contributions to the advancement of jazz. Mr Ibrahim’s work will be celebrated in a ceremony at the Kennedy Centre in April next year. ‘…a certain signature soulfulness that can only come from living life rich and full. Full of feeling, rich in experience (patience). And yes, a solo piano recital may seem simple but to this listener it once again revealed how exposed a true artist makes himself when heart, gut and soul combine with a voice unlike any other in the jazz piano tradition’. “We are honoured to be hosting these return concerts in Cape Town by Abdullah Ibrahim in the heart of his original home in District Six,” says Eric Abraham, Founding Producer and Owner of the Fugard Theatre. 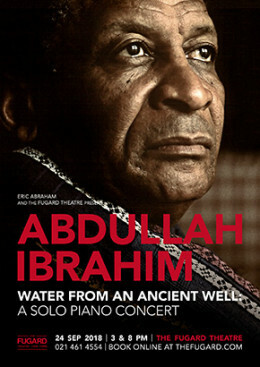 Mr Ibrahim will perform Water from an Ancient Well, two solo piano concerts at the Fugard Theatre on 24 September 2018. The 8pm performance is presented by the Fugard Theatre, with the 3pm matinee performance being presented in collaboration with the Japanese Embassy as part of the Japanese Consulate Centenary. There is a 15% discount available for the Friends of The Fugard members and a 10% discount for pensioners. These discounted tickets can be booked through the Fugard Theatre box office. Harrington Street car park is located at the corner of Caledon and Harrington streets and is available for the use of theatre patrons for a small fee. Visit the cosy ground-floor bar, where delicious snacks are also available, and which opens two hours before all scheduled show times and stays open until last rounds are called… often as late as 1am. And if the weather is fine the bar on the fantastic rooftop terrace is opened, with its panoramic views of the city. Both bars offer a range of wines from some of the Cape’s top estates.